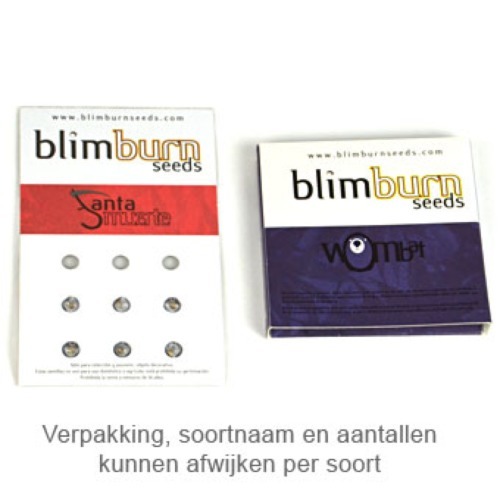 Original Clon from Blimburn Seeds are feminised cannabis seeds of very nice and stable quality. These cannabis plants won the Highlife Cannabis Cup in 2004 within the category General and Bio. This strain contains mainly Indica genetics and is originated by crossing Skunk x Afghani. Blimburn Original Clon cannabis plants have a Sativa like appearance. Elongated leaves with a bright light green color. This strain is very popular because of her short flowering time and she is also easy to grow that makes her suitable for the starting grower. This cannabis has a powerful and fruity taste. Growing cannabis with these feminised cannabis seeds provide you a fruity strain. De smaak van deze wiet bij het roken is krachtig en fruitig. Kweken uit deze feminised wietzaadjes levert je een heerlijke, fruitachtige soort op. Tell us and our customers what you think of the Original Clon from Blimburn Seeds.